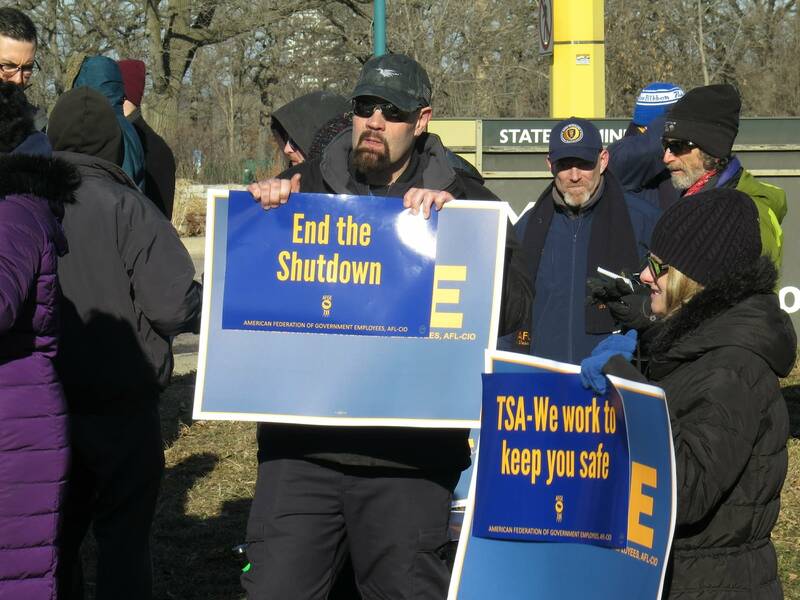 TSA agent Scott Shane, center, takes part in a rally with other federal workers and their supporters in Minneapolis on Thursday, Jan. 10, 2019. They urged an immediate end to the partial federal government shutdown. Matt Sepic | MPR News. Thousand have not yet received full back pay while scrambling to catch up on unpaid bills and repay unemployment benefits -- all while another government shutdown looms next week. She received two unemployment checks of $288 each during the shutdown before getting a letter informing her she was ineligible for the benefits -- even though she had been told she qualified. Binkley has paid the money back, but worries about another shutdown. It's been a difficult time for those workers, who often have a hard time finding a job in the first place, Kelly said. Theirs jobs include custodial and mailroom work at agencies like NASA, the Coast Guard and the Department of the Interior, he said.